wierd. apparantly the banned word is kinder ale. Now why that would be banned I have absolutely no idea. I went thru and tried deleting each drink individually till I got the thing to list..the drink that got it banned was Kinder ale. No clue why. Kinders are a type of elf..that you so do not want to ever get directions from. Adult...all alcohol gets that rating. I don't even try to fight that one. New materials are here, any merchants got anything neat and ideas on conversion time and pricing? I ran a test on the new materials viewer with exactly the same texture. One has 3 layers..diffuse, normal and one specular. Now I am still not entirely sure I did it correctly, but it does look different..slightly different. There are some huge drawbacks that I can see. One..we won't be able to use our current texture changer programs with this because in order to create the image, you have to lay three textures on each item. Also, the textures cost 3 times as much (because you have to have three copies of each image..one a light purple (the 'normal' one) one that to me is the normal one..thats the 'diffuse' one and one thats black and white (thats the specular). No idea why they use these names..thats what they call them. So yes...there is a difference, and I can see using them sometimes. But...enough to lose out on the texture changing feature? About half my stuff has a texture changer in it..and I would have to ask, which dyou want...the added shine on the one texture..or a hundred textures to choose from? The materials one is on the left. Why do items come in boxes when they don't need to? I have done both (asked for a refund and deleted the maps). My issue is not with me building. I have enough maps that I could build forever with what I have and not ever need another map. I do still buy them because I want all my builds to look different. What I believe is that alot of the sculpt makers are taking their tos from other sculpt makers and do not realize that their tos is so restrictive it prevents folks from using their maps on builds without breaking the tos. I have spoken to several map makers and shown them how a decanter works. Once shown, most of them (not all, I agree, but most) have changed their tos or at least changed it for me. I did not start this thread to help me. I started it because I want to help other builders and map makers. I would like the map makers to understand they are shooting themselves in the foot when they put these tos on their maps. And I would like other builders to know what these tos mean to their builds. 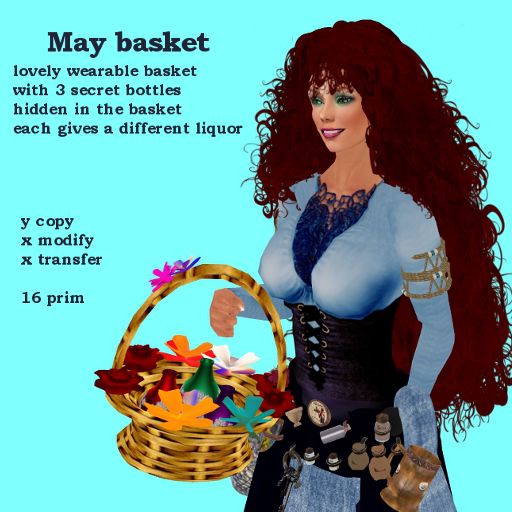 In Second Life, you cannot currently build a decanter of any kind..and that includes a cake that gives out slices of cake, a teapot that gives out cups of tea or anything else that gives out anything with items made from maps with those tos without breaking the tos. I did contact the Lindens about this, and they told me that if you sell something full permission, that is exactly what it means. Full permission. That the person making the item cannot then go and add restrictions on how it is used. They did say they would prevent me from reselling a texture I purchased, but not what I used the texture on. I have not done so, but thought it was interesting that they have expressed the opinion that these tos are unenforcable. It will be interesting to see how the tos are enforced on mesh items. Unlike maps, you can actually see who made the mesh easily. I use firestorm, and know I cannot see the map makers name on firestorm, but I understand other viewers do allow you to see who made the maps used to make an item and the name of the person who made the textures used on an item. It is a challenge. It is especially a challenge when the tos are not clearly posted on the marketplace listing or when I go to their in-world shop and see no sign of their tos. So I spend the money, buy the sculpt map and then find the tos says I cannot use it for my builds. Its very frustrating and restricting. What I do not understand tho, is what they (the sculpt makers) are protecting. A sculpt map is a texture. Would you buy textures that had as part of their tos that you could not use the texture on anything that you made that was copy/trans? or where the texture maker has as part of their tos what permissions you would put on your finished product? If not..then how is a sculpt texture any different? I think your missing the point here. What my point was is this: The sculptie makers are making items that inherently should be used in a decanter..ie cups and mugs and glasses sculpties. Things to make drinks from. And then making it impossible to comply with their tos and make anything from them. If you want to make a cup of tea to just set on a table, then thats fine. But if you want to wear it, if you want your customers to wear it..then it must be copy/trans. No one can comply with the tos folks are putting on these sculpts and build any kind of decanter. I do not think there are many folks out there wanting to set out a teacup, tho I could be wrong. I do know that there are alot of builders out there that must be buying the sculpts and then ignoring the tos. I know when I buy a texture in sl, I do not have to worry about these tos on the texture. I have never seen a texture put for sale in sl where the tos say what permissions I must put on the finished product. But that is rapidly becoming standard procedure on sculpt maps. I make drinks and decanters. I make other stuff too, but thats my main product. What is a decanter? It is something that gives something else away on a touch or from a menu. Example: i make a cup of Willowbark Tea. That is the drink. I place the drink into a prim I call "teapot". The teapot is the decanter. I can put one drink it. I can put a hundred in it. It is still called a decanter. For this, I will call them cup and teapot. I want to sell the teapot on the marketplace. The teapot can have any permissions. The cups in the teapot MUST have copy/trans rights or the teapot will break for the next user. Guaranteed. The reason is this. If the cup in the teapot is copy only...or copy/mod, only the owner of the teapot will ever get a cup from it. If the cup is transfer only or transfer/mod, the teapot will only ever give out one copy of the cup, then it will break. This same applies to food. If I build a tray with food on the tray that only vanishes or maybe vanishes and emotes that its being eaten, no problem. The food can be any permissions. If it is to give out food so that the next person can wear the piece of meat or cookie, problem. Like the teapot above, if the food is not copy/trans (what is given out, not whats on the tray) the decanter will break. I am unsure what the sculpt map makers are trying to protect with their tos. If an item I build is copy/trans and no mod, no one can get a copy the map. Yes they get a copy of the teacup. But..its scripted. And the scripts in it are no mod, no copy, transfer only. SO they cannot change what it emotes, or who made it. And it is my build, so if they give it away, they are still giving away what I made, not the map. And yes, there may be a ton of copies of my willowbark tea, but that should be my worry, not the sculpt map makers. As I, as a builder, am going to buy maps for my builds, they are not losing anything. What really concerns me is not my builds. I have an absolute ton of sculpt maps. I make my own. I buy them regularly from folks that do not have that tos or are willing to allow me to use thier maps with my tos on them. What concerns me is the new builders coming up. The ones that are starting out. They cannot use these tos and I see the tos on more and more stuff. And also what worries me is the folks that do buy the sculpt maps and use them on their builds and then either find out they cant give away/sell them as is..or choose to ignore the tos of the maker. Both situations are totally unfair. Either they, the builder run the risk of a dmca or else they wind up spending money on something they cannot use. I just tried an experiment..added a script that I wrote to a prim I made and it worked fine. Then I edited the script and changed it..and it also saved just fine. So It has something to do with the fact that I did not write the original script. Because I still cannot edit that script and get it to save while its in an item worn by me. And I cannot drop another script not writen by me into a worn prim either. I be totally shocked. I did an experiment. Created a new script in my inventory. Copied the entire full perm script I have to it...and saved it in my inventory. Wore the drink I am trying to script. Edited it. Dropped the new script into it. And IT SAVED! So I then edited the script and changed the emotes on it..and IT SAVED AGAIN! The issue is therefore something to do with who wrote the script. Because when i copy his script into a script created by me, it works. Darn good thing the script is written by a friend of mine *grins* cause the only way I can rescript this many items is to use the one that appears to have been written by me. so your saying this is fixed? Cause I can tell you that my issue is most definately NOT fixed..its very new and is driving me insane..and ya I know it aint a long trip..but its sure a frustrating one. oh ya they are definately related..and I bet they are all related to the latest upgrade..but its also slightly different...thats why I was saying its not a duplciate but its related for sure.